According to this theory, we learn best when we observe another person and imitate his behavior and actions. When we see our “role models” better their lives and that of others with their actions, we are inspired to learn more. You follow your favorite blogs to learn new ways of writing and how the masters play with the language. You follow art and photography sites to pick up Photoshop tricks and learn DSLR hacks. At work, you observe your peers and seniors to learn the tricks of the trade. We read self-development write-ups to learn how the achievers in our society begin their day, keep away distractions at work, and remain consistently productive. We are learning “socially” almost always. It has been proven that Social Learning is an effective training strategy for the workplace too. What is exciting is that with the advances in digital technology and the influx of social tools, the “social” element can be easily incorporated into eLearning. Because this concept is gaining ground steadily, you would want to know more about it, how your organization can implement it to create more effective training modules, the myths that surround this concept, and how to design an immersive learning experience. Luckily, experts have penned tons of material on Social Learning, and we have cherry-picked 10 of the best resources on the Web to help you find your way through the sea of information out there. The following resources are for you if you are new to the world of Social Learning. For starters, whatch this short video about What is Social Learning? The Internet abounds in definitions of Social Learning, so you know (more or less) know what it is. But do you know what it is not? Clark Quinn is an industry expert and thought leader, and he clarifies the misconceptions surrounding the concept of Social Learning in this article. He also lists the factors that make for an effective and focused social learning experience. You now know what Social Learning is and what it is not. Now, what? You will, of course, want to know how Social Learning is relevant at work. You will want to know how Social Learning can be implemented to help organizations fulfill their core objectives. Jane Hart explains the different types of social learning in an organisation and why organizations should take Social Learning a step further and create a culture of Social Collaboration that focuses on working together to achieve specific business goals, drive innovation, and spur growth. 3) Is Informal Learning the Same as Social Learning? The “social” in the moniker might confuse you. Because we tend to associate informal with social, you might think that social learning takes place only in informal setups. This article explains with the aid of relatable analogies how social learning is not always informal and why informal learning may not always take place in a social environment. Learning the difference between these two forms of learning and where they tread common ground will, in turn, help you better understand Jane Hart’s concept of Social Collaboration. The “social” in the moniker continues to lead to confusions! Because of how we communicate nowadays, social has become synonymous with social media. So Dan Pontefract explains why Social Learning is not the same as social media. While Social Learning is a behavior, social media comprises the tools and platforms that help individuals manifest this behavior. The employees in an organization might use Facebook and Twitter during work hours, but they are not engaging in social learning if they don’t exchange meaningful and relevant ideas and information on these platforms. 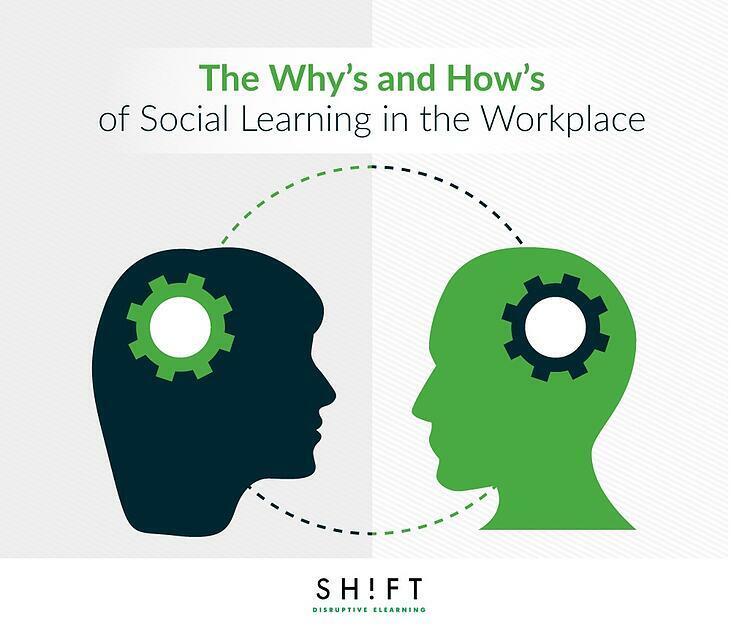 Read this article to know why you must teach your employees how they can learn socially and also weave these tools into the learning cycles. As it is with all little-known ideas and concepts, Social Learning too is steeped in myths and misconceptions. These myths, in turn, create fears, apprehensions, confusions, and doubts that prevent you from exploiting the true potential of this learning strategy. Helen Blunden busts the popular myths that surround Social Learning. Ponder over myth #4; it is especially relevant for instructional designers. As Dan Pontefract had also said, Social Learning is not about social media tools; it is about how people use the tools to learn. And to make learners use these tools, you have to build social learning systems that are responsive and intuitive. In this post, Blunden emphasizes why it is critical that you create social learning systems that ease the process of learning socially. If you have grasped the concept of Social Learning, you will now be excited to implement it in your workplace. Read these articles to learn how you can make it work effectively. Yes, Harold Jarche wrote this post in 2010, but it is relevant even today because he has nailed the essence of Social Learning—driving specified business outcomes by enabling groups to work together and share knowledge using social networks—right on its head. In fact, Jarche’s post is more relevant than ever before because we are now witnessing a landmark shift in our relationship with knowledge. Creating training modules for adult corporate learners is becoming increasingly complex, and the role of an instructional designer has become intangible. Jarche advocates five ways to execute social learning in an enterprise setting with TRUST as the basis of each. We live in an interconnected world; we buy products that our friends recommend, follow productivity hacks listed by our favorite blogger, and read articles that get the most Likes from our tribe. We make choices and alter behavioral patterns based on TRUST. Jarche’s post is a compelling read because he not only provides ample takeaways but also includes examples of real-world organizations that have successfully implemented social learning by creating an environment of trust where knowledge is shared freely, accepted readily, and internalized willingly. 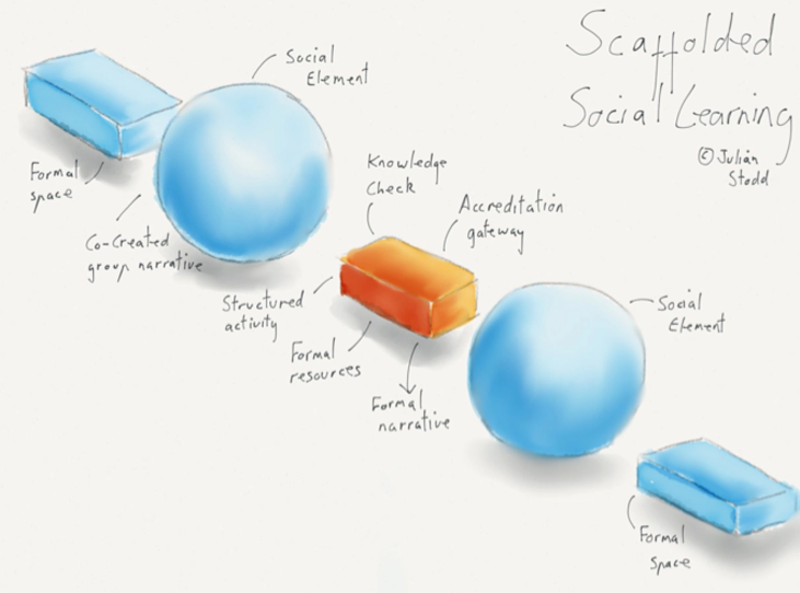 Julian Stodd’s Scaffolded Social Learning Concept retains the spontaneity, vibrancy, and high engagement quotient of “social” interactions without taking away the formality and structure of learning within an enterprise setting. It’s a combination of both. So an organization may design a curriculum and provide the information, but leave it to its employees to analyze, brainstorm, and interpret the knowledge themselves using social tools. The key here is giving learners space to co-create that makes the learning process immersive. This is a detailed post. Stodd explains what is Scaffolded Social Learning using analogies, what it is not, how to design such a learning experience, and how to evaluate it. The world today is in a state of flux, so it is natural that the learning process should adapt to the changes taking place around us. What better way to add dynamism to the learning process than by unlocking the power of the tribe and opening the floodgates to virtually (the pun is intended) limitless tacit information and multiple insights, ideas, and viewpoints. And because we live in a Social Age (a concept that Stodd illustrates here), what better way to bring the tribe on board than by implementing Scaffolded Social Learning. What is the biggest obstacle in the way of implementing social learning in organizations? The reluctance of the top brass to give it a chance. But they can’t be blamed either; after all, they don’t know how they can evaluate social value approaches. Marcia Conner points out the metrics that help measure the efficacy of social learning. For instance, if the number of participants is growing or if they are increasingly taking part in multiple activities, it is a clear indication that the methodology is providing value. Conner lists several more metrics. These statistics are easy to obtain, and you don’t have to do much number crunching to draw conclusions. This post is an eye-opener. It rakes up an uncomfortable question: we live in a Social Age, yet why are organizations floundering in their attempts to implement social learning in the workplace? The solution lies in integrating social learning into the culture of the organization. The author rightly points out that organizations too often try to “enforce” social learning on their employees. They bombard them with social tools and technologies and then expect them to engage on these platforms. But where is the TRUST? As Harold Jarche had also pointed out, organizations must create a supportive, trusting culture to encourage employees to open up, share information, and imbibe the knowledge they receive. Carry out an unbiased investigation to find out what’s stopping employees, who are naturally social humans, from collaborating. Define a detailed and unambiguous change management strategy. Redefine the processes and systems that will facilitate the change. In an interconnected age, work is learning and learning is the work. Your employees learn while they work. So Jane Hart poses a logical question: why thrust a whole new social learning system down your employees’ throats and make them learn a new tool—with a new interface and new ways of communicating—when your existing Enterprise Social Network (ESN) can suffice? Isn’t it appropriate that employees use the same tools for working and learning? After all, you want them to interact and engage with one another to share knowledge and help each other improve their skills at work. That’s why, Hart lists 10 ways to use the ESN to facilitate social learning. Social Media for Trainers by Jane Bozarth: Techniques for Enhancing and Extending Learning (Essential Tools Resource): This is a tome of strategies, solutions, and technologies to help you use social networks to drive learning. Marcia Conner has posted a review of this book here. Social Learning Handbook 2014 by Jane Hart: Jane Hart provides ways and means to facilitate social learning in the workplace to create a collaborative culture. The New Social Learning: Connect. Collaborate. Work. By Tony Bingham and Maria Conner: By Tony Bingham and Maria Conner: This book presents several case studies of organizations, like Boston Children’s Hospital, Sanofi Pasteur, Cigna, and Roche Pharmaceuticals, that have successfully used social media tools to drive social learning in the workplace. There are ample takeaways in this book.